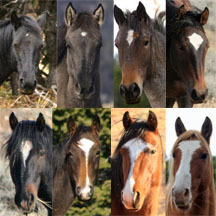 The Pryor Mountain Wild Horses have distinct colors and conformation reflective of their Spanish heritage. Conformation refers to the way a horse’s body is shaped. 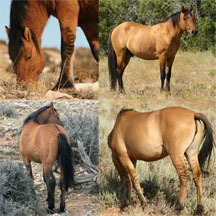 The Colonial Spanish Horse has a distinct conformation, and this is the type of conformation typical of the Pryor Mountain Wild Horses. These horses tend to be 14 hands on average, though some can be a little larger or smaller. A very distinctive feature of them is their face. They tend to have wide foreheads that taper to a small muzzle, giving them a V-shaped face. They tend to have large, expressive eyes and small ears that slightly point inward. The profile is their heads are flat to slightly convex. The horses have narrow but deep chests, with the front legs often being slightly closer together than the back legs. They have short, strong backs and distinct withers. The croup is sloping, and they have a low-set tail. There can be variation in this conformation due to variation within the Colonial Spanish Horse and likely due certain adaptive features. 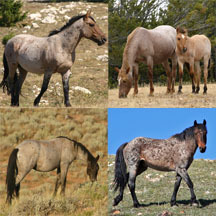 The linebacked dun family of colors is very common among the Pryor Mountain Wild Horses, and these are the colors most often associated with the herd. 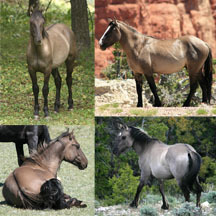 Linebacked duns are horses of a base color that is affected by a genetic trait called the dun allele. The dun allele lightens the coat and adds primitive markings to it. Primitive markings are stripes and bars. These include a stripe running down the back (a dorsal stripe), “zebra” stripes on the legs, wither bars, fish-boning off the dorsal stripe, and spider webbing on the face. These different markings aren’t all always present on each Pryor Mountain Wild Horse, though all of them have a dorsal stripe and and nearly all have distinct leg stripes. Dun: This color is often called “zebra dun” though it is also referred to as dun as it is the most common linebacked dun color. As such, dun is the most common color in the herd. Dun horses can come in different shades, but most are golden-tan in color. Duns are bay horses affected by the dun allele. Grullo: Grullo is also a common color in the herd. Grullo is a Spanish word which refers to the slate-like color of a crane. It is pronounced “Grew-Yo.” Because the word is Spanish, it is proper to use grullo in describing males and grulla in describing females. Grullos are black horses affected by the dun allele. Red Duns and Apricot Duns: These colors are rare in the herd. They have coats and stripes that are red or orange in color. They are chestnut horses affected by the dun allele. 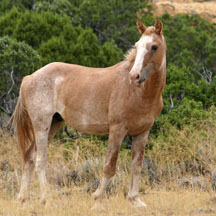 Though linebacked dun colored horses are the most common in the herd, there are also other colors that can be present. It is a common misconception that non-dun horses are “the least Spanish”, but this is not true as Spanish horses can be any color. 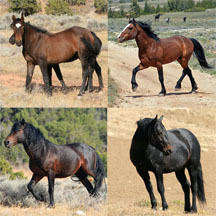 Bay: Many Pryor Mountain Wild Horses are also bay. Bays have dark coats with red highlights. These horses can range in color from dark bay to red bay. 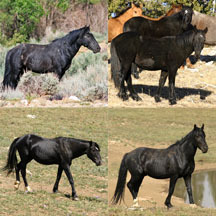 Black: Many Pryor Mountain Wild Horses are a true black color. Blacks can come in different shades.In the Pryors, variations of black can be seen such as seal brown. Seal brown horses have nearly black coats with gold/red highlights. Chestnut and Sorrel: Horses of these colors are rare in the herd. The colors of them range from copper-red to brownish-red. Flaxen manes and tails can also be seen on some of them. Palomino: Palomino is rare in the herd. These are pale yellow horses that can have variations in their shade. Buckskin: Buckskin is similar to palomino, and it is similarly rare in the herd. Buckskins tend to be horses with yellow-shaded bodies and black points. White patterns and markings are often seen among the Pryor Mountain Wild Horses. However, spotted pinto-type horses are not present in the herd. Roan: Roan doesn’t refer to a color; it instead refers to a pattern where a base color has white hair mixed mainly into its body coat. Thus, in the herd there is the potential for dun roans, grullo roans, blue (black) roans, bay roans, palomino roans, and the like. There are a number of roans in the herd that are these colors, but most are bay or blue roan. Sabino: Sabino is similar to roan in that it refers to a color that has been modified with white hairs. Sabino is an overo pattern, which is a pinto pattern. Sabino can be described as a base color with white on the face, legs, and belly. These white markings can be solid but can also look roan. The horse pictures to the left is Medicine Bow who recently died. He was the last Pryor horse to show the sabino color pattern. White markings are often seen on the faces and legs of the horses. Face markings can range anywhere from tiny dot stars to full blazes. Leg markings can range from subtle coronets to full stockings. To learn more about these colors and the genetics behind them, please refer to Equine Color Genetics by Dr. Phillip Sponenberg. The descriptions and conventions used above are consistent with those discussed in this book.